This final template contains 13 pages patterns, those patterns will form Iron Man XLII hip and leg parts, including a display stand. The joints and many parts are very familiar, some are reuse and redesigned from Mark VII joints. The display stand also use the same shape as the previous Iron Man model from Paper Replika. This template is designed by Cristiano Luis Dias and colored by Suraj S. Prakash. This template contains of 5 pages of patterns. 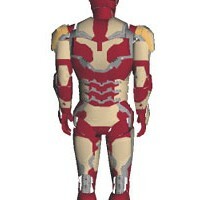 Just like previous Iron Man paper model at Paper Replika, this model is also a poseable paper action figure. Becaus it will be made out of paper, so I suggest to pose this model after all parts are completed then glue the joints with super glue so it will become a fixed statue. 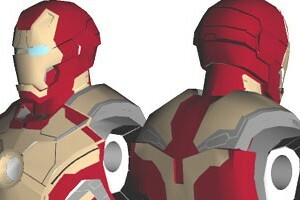 The joints and the parts are very familiar for those who have build previous Iron Man templates. Part 3 will be released soon. The template was designed by Cristiano Luis Dias and colored by Suraj S. Prakash. Some people asked me why don't I make a template of Iron Man Mark XLII from the new Iron Man 3 movie, because I never plan to do it. 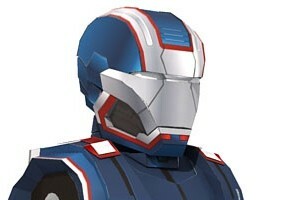 My plan is only to make Iron Patriot. But actually that's not quite true, because I did make the template, but It is for Cinemags movie this April special edition magazine bonus, a simple one and unfortunately it will not shared for free. So when Cristiano emailed me to share his own template, I feel so happy that finally Paper Replika has Mark XLII template to share. The template contains 6 pages of patterns, the scale is unknown, but it looks like in 1:6 scale. The template was designed by Cristiano Luis Dias and colored by Suraj S. Prakash. Couple months ago I post a polling about which paper model to be make for the new figure paper model and Iron Patriot won the vote. 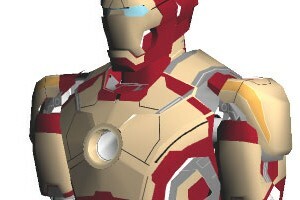 Just like previous Iron man models, this model also comes with 2 version of templates, colored one and blank or white version. The built size is a little bit bigger then Iron Man Mark VII and War Machine to be exact at 1:6 scale. The colored template has 4 pages and 5 pages for the blank version. Also like the others this one will be pose-able with articulated joints. 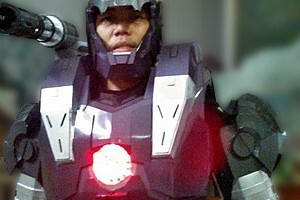 Iron Patriot is based on the War Machine suit in the upcoming Iron Man 3 movie, but with special weapon and color. Its color is very similar to Captain America, the American flag. Inside this Iron Patriot suit is Lt. Col. James Rhodes (Don Cheadle), who in Iron Man 2 was wearing the previous version of War Machine suit. This model template will be released in 3 parts. The second part will be both arms and shoulder weapon and the last part will be his hip, legs and the display base. After few adjustment on the pattern, finally Lee Gunawan shares his work on this 6 times bigger War Machine part 2. I mention before about his purpose to make a statue, now the plan is slightly changed, he wants to wear this armor too :D. For your information this pattern is enlarged 6 times from the original Paper Replika pattern, and he use A3+ paper size art card and print it with laser digital print. He also add LEDs on the armor's chest.